Metal Gear Solid V: Ground Zeroes has drawn up a bit of controversy in these past few days. It started with a Game Informer article, which says they were able to finish the game in "about" two hours. That was shortly followed up with information that Kojima Productions speed-runners were able to finish the main mission(Of which there is only one. The rest being side missions.) in 5 minutes. The controversy surrounding the game chalks it up to being a cash-grab for Konami, a clear plead for more money. They've hit a "roadblock" that Ground Zeroes could clear, people say. Konami needs money, and they are splitting this segment of the game from the rest of Metal Gear Solid V: The Phantom Pain, to earn it back, and that's not cool, people are saying. The reality with this scenario is that The Phantom Pain is an unknown amount of time away and bears such a drastic change from the traditional Metal Gear Solid formula that it would benefit both the fanbase and Kojima Productions by easing players in with a tutorial. But it's not just a tutorial, there is a narrative that will lead players into the next game, The Phantom Pain. This way, with as far out as The Phantom Pain could be, they can incorporate feedback right into the game and improve it even further. But for some people, this isn't good enough. Let's look at the pricing for Ground Zeroes. Hmmm. It's actually quite pricey, isn't it? It may be quick to write off most people as "the internet" we all love to hate, but when you look at the numbers, for a game that can be potentially completed in 5(Read: FIVE) minutes, those higher numbers start to look worse and worse. It's definitely interesting to see a reduced price for a small taste of the game, that definitely makes sense and it's nice to see publishers making such forward progression towards the realization that digital games are cheaper than retail games, due to no case, and less overall cost to them, the additional price on the PS4/Xbone versions are not so nice. In practice, you could end up paying double the cost for one version of the game than the other. It's nice to think that Konami would be so progressive with its pricing for digital being less, but it forces me to think the opposite when you see next-gen versions are more expensive than their predecessors. When you boil it down, what advantages does the PS4/Xbone versions really have to offer? Better graphics? Faster loading times? Is that worth paying twice the price for it? When you boil it down to looking better and loading faster, under all of the grime and glitter, it's the same game. No additional content will be applied to the next-gen versions, no additional support is planned. When you buy the game, you get the game, whatever version it happens to be. 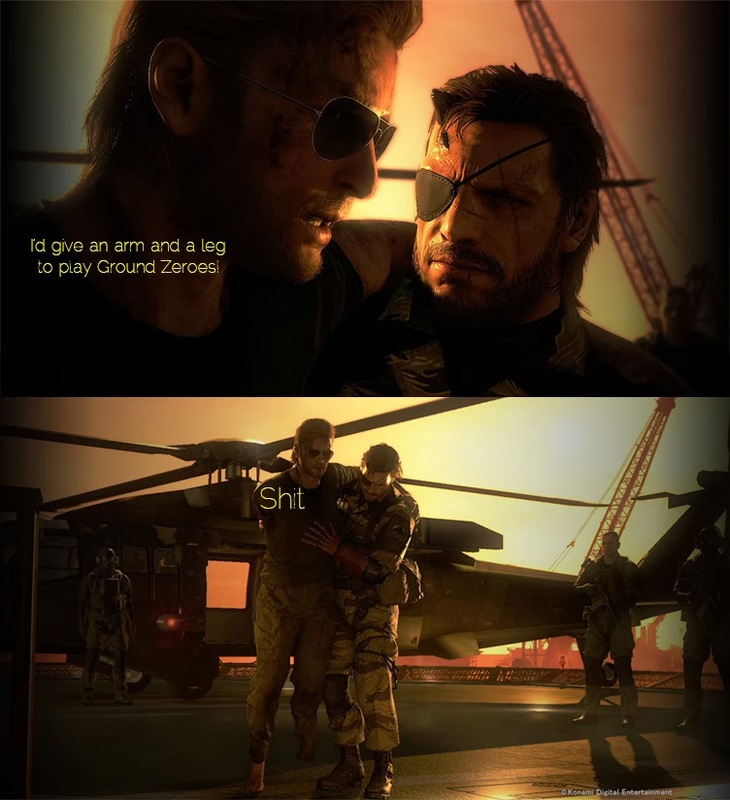 In my opinion, people have a right to be peeved about the situation with Ground Zeroes. In my boat, I have always planned on buying digitally for the PS3, which in my opinion, is the most appropriately priced version, $20. For $20 you get one short mission and 5 side missions, and a couple of cutscenes. You also get to play around with the brand new mechanics, weapons and world of Metal Gear Solid, which is the biggest selling point to me, but not many people would agree with me on that. For a time, you could get a game titled Assassin's Creed IV: Black Flag for around $40 when it was on sale. That game consists of at least 50 hours of content. For someone without a lot of money, that $40 commitment is a no-brainer. Assuming you like the Assassin's Creed formula, you are getting tons of content per dollar. A stark contrast to the content you will find in a game like Metal Gear Solid V: Ground Zeroes, which is already the spark of debate around the net. How much you spend vs. how much fun you have, that's something you'll have to figure out for yourself. But as Hideo Kojima and the rest of Kojima Productions have recently posted around their social media counterparts, they truly believe in the quality of their product and will proudly see the title on shelves next to games very much like Assassin's Creed IV: Black Flag. Regardless, there are people out there that would probably pay even more.